Little Mouse comes across a yummy-looking chocolate-chip. Raspberry-cream cupcake and quite fancies taking it home. Unfortunately, it is rather large and he can’t carry it all the way back. Enters Bird, Frog, Mole and plenty of others who are all quite keen to help, but more importantly to have a little nibble at the cupcake! Little Mouse is very kind and lets them all have a taste. 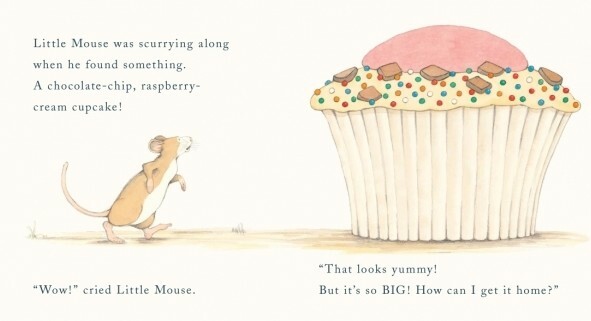 The hungry lot munch most of the cupcake away, but will their greediness help solve Little Mouse’s problem? 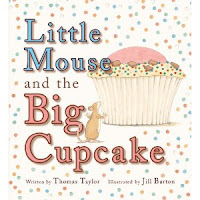 This candy-coloured picture book is a great read-aloud and offers a great opportunity to share the story and follow on with some cupcake baking. This is quite current too, considering the present cupcake craze. Jill Barton’s illustrations are as soft as ever, She excels at bringing anthropomorphism to life successfully in her illustrations (remember Pig in the Pond?) and her drawings work well with this particular text. The story itself is fun. You empathise with Little Mouse who is having his cake eaten up but there is a silver lining at the end when the size of the cake turns out to be more manageable once all have had their share. There is a message about the pleasures of sharing of friends which will not be lost on a young audience, although more mature (cynical?) readers might find the fact that Little Mouse is finding succour in others’ greediness and selfishness quite puzzling. Regardless of this, Little Mouse and the Big Cupcake remains a lovely-looking picture book which is a pleasure to share.